For the cultivation of anaerobic and microaerophilic microorganisms in a defined gas atmosphere. Principle: Evacuating (with vacuum pump) and filling with gas (e.g. nitrogen) without chemical accessories, or with chemical anaerobic systems (GasPacks), available as accessories. The most of them are equipped with two corner valves incl. tube clips for flushing and vacuum hoses (5 mm inner-Ø) with manometer for exact control of the vacuum or over pressure (-1 to 0.2 bar). On request, the lids are available as custom-made versions, e.g. 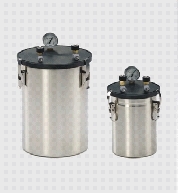 made of other material, without valves/manometer or equipped with high-temperature manometer. Racks (optional): For Petri dishes, multiwell plates or test tubes. Equipped with holder for anaerobic systems. suitable for jars "large", "small", "standard", "eco", "crystal"
suitable for jars "large", "standard", "eco", "crystal"